Not many tourists visit the Uists in autumn / winter but for the ones who do venture out to this remote part of scotland it is alway a special experience. The western isles welcome a countless number of migrating birds including Kittiwakes, Pomarine Skuas, Grey Phalaropes, Velvet Scoters, Blackcaps and Bramblings. And from our windows we can see the flocks of Greylag and Barnacle geese resting on the croftland in their hundreds. We have had a very busy season with visitors from all over the world and it was great to see how they all enjoyed their stay. Lots of inspiration for the photographers, musicians and artists who stayed with us and plenty of beach and ocean for kite surfers, scuba divers and nature lovers. For those who are less attracted to the winter weather, our rooms are spacious and comfortable to enjoy time inside with a book, a sketchbook or a boardgame. The groundfloor guest-room is a spacious and bright two person en-suite bedroom with underfloor heating, a door leading outside and it offers two comfy beds and a corner-table with a choice of hot beverages. It has it's own entrance by using the french doors facing south. They welcome the sun from early morning and give you the chance to open your room for nature. But if you want a long lie-in, you can always keep the curtains closed. With three big windows facing west and one window/door facing north you have plenty of opportunity to enjoy watching birdlife. But of course you can also watch a DVD, listen to music or read a book and while the red-orange sun sinks into the Atlantic Ocean, the long summer evenings can be very enjoyable. Bagh Alluin has it's second guest room on the first floor. 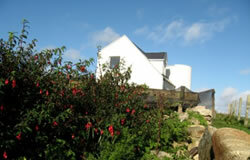 A large double-room en-suite with excellent views towards the Atlantic Ocean and the hills of North Uist. The ground floor twin/double offers a large, underfloor heated powerful shower and our first floor double room offers a large bath/shower. Towel radiators can take care of your wet towels when returning from a swim in the Atlantic Ocean. Ask for our special offers for families or long stays. All rates include a continental breakfast.